In the midst of the global awakening, with widespread outbreaks of revolution and revolts, while uprisings and protests around the world are coordinated through social networks and mediated through other forms of electronic media, a natural and organic transformation is also growing--a grassroots artistic movement is blossoming--A Potato Revolution! The Potato Revolution takes its inspiration from the most nutritious and abundant vegetable on planet earth – Solanum tuberosum. The potato’s value as a source of food is well known and appreciated, but the potato has also been a significant symbol and subject of art as far back as its discovery in the Andes Mountains at least 10,000 years ago. The Cult of Potato artists following in this tradition are as varied and diverse as the 5,000 species of potatoes existing on planet earth. 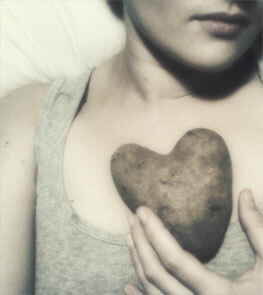 The Potato Revolution reveals that the potato is as rich in content as it is in vitamins and minerals. The storied and complicated history of the potato is chronicled by Australian-based Kitty Owens in her series “Postcards from the Potato” tracing the potato’s journey from Peru to Europe and back to the New World. Modern master, Italo Scanga and his altar-like “Potato Famine” sculptures give a powerful reminder of one of the most traumatic events in human history, The Late Blight that caused the destruction of Ireland’s single source of sustenance. Scanga’s primal offerings include a large wooden spike impaled all-over with real potatoes. Viviane Le Courtois room-sized video installation ”Générations d’épluchures (Generations of Peelings),” remembers and re-enacts her French family’s tradition of peeling potatoes by hand. Her collected mound of dried potato peels are the sculptural residue of her communal Potato Potluck dinners organized at her home in Denver, CO. connecting the potato with the idea of community, self-reliance and natural living. Several of the artists in the exhibition grew up in geographic locations known for their reliance on the potato for survival. Now based in Ontario, Photographer Andrzej Maciejewski grew up in potato-dependent Poland, and his potato still-life “Garden of Eden” recasts the potato as the biblical forbidden fruit-the apple of the earth. His “V.I.P. series (Very Important potatoes)” features unique portraits of distinguishing looking potatoes skewered on forks. 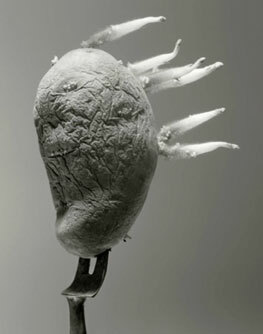 Cologne, Germany-based artist Adrián Villa Dávila grew up in Columbia where the potato is revered like a deity. Her potato work creates a poetic hypothetical friendship between two master potato artists of the past, her fellow South American, Victor Grippo and the Dutchman Vincent van Gogh. Another Cult of Potato artist also references van Gogh in his work, Michiel Brink, from Rotterdam, Holland and the world’s foremost Potato Musician (and a founding member of the Cult of Potato), has been writing songs about potatoes for over a generation. His band de Aardappeleters (In English-“The Potato Eaters”, named after the famous painting by Vincent van Gogh), presents a new CD of songs with accompanying drawings. Adam Taye’s upbringing as a Mormon in Idaho led to a unique understanding of the spiritual connection between potatoes and basketball, as demonstrated in his didactic sculpture, “Esto Perpetua/ I Will Fight No More Forever”. His experiences as a young potato farm hand in the land of potatoes-a-plenty are also humorously referenced in his “Erased New Yorker Cartoons”. 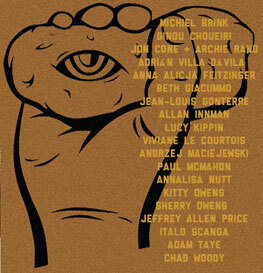 Master printer Jon Cone has included “the world’s largest Potato print,” a collaboration with painter Archie Rand. 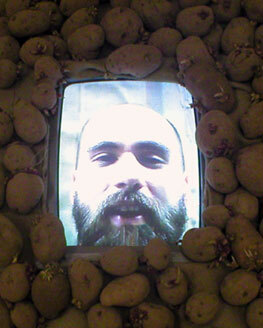 This project combines large-scale potato printmaking processes with experiments in sleep deprivation. The potato as artistic medium takes its ultimate form in the work of Beirut-based artist Ginou Choueiri, whose life-like “potato portraits” perfectly synthesize potatoes with humans using portraits of actual people on the skins of real spuds. French artist Jean-Louis Gonterre known for his interest in photographing potatoes presents a new series of pictures placing giant potatoes in configurations related to acts of tension and heat. Brooklyn-based Anna Alicja Feitzinger’s photographic installation examines the potato through the lens of biology. Magnifying the potato plant through a microscope and photographing its microcosmic reality, she re-imagines the potato as the origin of the universe. The potato’s prodigious comedic possibilities have been masterfully demonstrated by performance artist and author Paul McMahon, whose interest in potato puns led to him publishing an entire book of “Potato Jokes”. 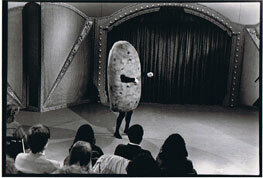 His potato stand-up act immortalized on the Soupy Sales show and other related ephemera from McMahon’s potato days are on view. The spirit of the Potato Revolution is encapsulated by the work of London-based potato artist Lucy Kippin, whose exciting installation “Dig for Victory” and “We the Made Lucky Few” casts potatoes in wax and also as supporting characters in a call to action and show of unity. 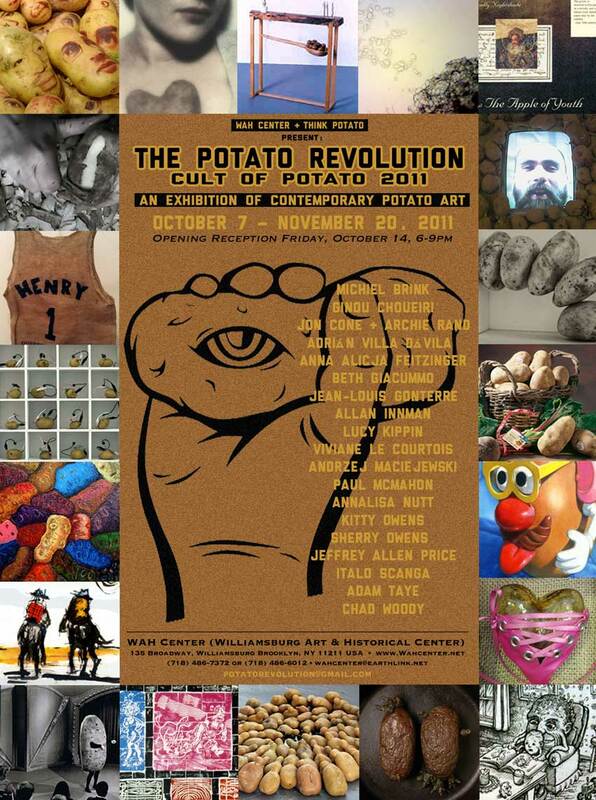 Potato Revolution organizer, THINK POTATO Founder, co-founder of Cult of Potato, and Potatoist Jeffrey Allen Price, presents “Potato Shrine” an interactive installation of potato-themed art and artifacts from 15-years of making, collecting and researching Potato Art. Also, on view his “Potato Revolution Café,” downstairs in the WAH Center’s main entrance. J.A.P. describes the café as a “Potato Speak-Easy” and “Temporary Headquarters of The Potato Revolution.” Armed with potato-themed food, drinks, art and memorabilia “The Potato Revolution Café” will be open for Special Event Days between October 7 and November 20, 2011. 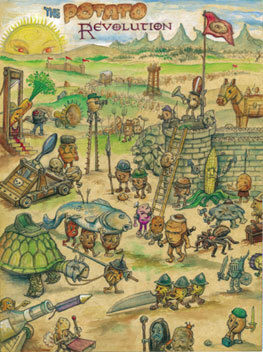 A special musical performance by J.A.P.’s new band POTATOTRON on Friday, November 11 at 8:30pm.